The Free City’s austere feudal history defines the city’s current freedom-loving citizenry. After suffering under the long, harsh reign of the aristocratic Stross family, the people of Zobeck have little love for nobles or the institution of feudalism. Still, certain citizens are not as free as others. The kobolds fought alongside the rebels to emancipate Zobeck and thus gained a seat on the Free City Council, but on the whole, the kobolds remain very much second class citizens. They do not experience the same uplifting spirit of freedom as their dwarf or human neighbours, or even the gearforged. Temple of Rava, Temple of Lada, Temple of Mavros-Perun, Temple of Volund (also called Svarog or Aten), Temple of Yarela and Porevit. The Ancient Temple of Khors is now a temple to his father, Volund, but there are still many statues of Khors throughout the city and worshippers are welcome in the Chambers of Volund. For further details on Gods of the Crossroads, see Deities and Powers. The Brewer’s Sisterhood, The Stonemason’s Guild, Wainwright’s Guilt, The Vinters’ Guild, Lanternmakers’ and Tinkers’ Guild, Limner’s Guild, The Black Lotus, Hommnal’s Botanical Rooftop, The Dented Shield Hotel. Honourable Order of Weavers, Ancient Order of Jewellers, Carpenter’s Brotherhood, Cooper’s Union, Order of Arms and Armoury, Order of Tanners and Leatherworkers, Six Lanterns Playhouse. 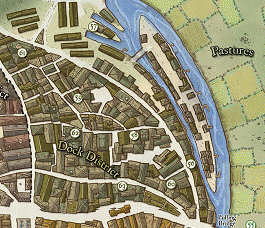 The Great Stross Clock Tower, City Archives, Civic Courthouse, Council Hall, Redrock Bailey, The Seven Bells Tavern, The Silk Scabbard, The Old Stross Public Bath House. 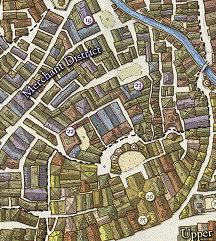 The Wheatsheaf Tavern, Moon’s Grace Temple, Red Queen Gambling Hall, Shrine of St Charon, Spyglass and Cartographers’ Guild, Miners’ Brotherhood, Ragpickers’ Guild, 10 Wheatsheaf Lane, The Tarnish, 33 Kingston Lane and Blue Water Inn. 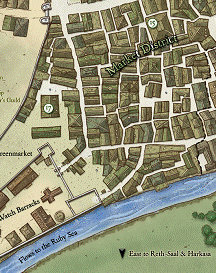 Blackened Fish Tavern, Greymark Warehouse, The Dancing Bear, The Moon and Owl Tavern, Alter of the Lorelei, The Bargeman’s Fellowship, Shipwrights’ and Chandlers’ Guild, Stevedores’ Brotherhood. Arcane Collegium, Hedgehog Tavern, The Vigilant Scribes, Temple of Celestial Dawn, Fellowship of the Arcane Collegium, Chartered Brotherhood of Alchemists, Arcane Square, The Book Fetish. Ghetto Gate, King of Kings’ Palace, Royal Workshops, Kobold Docks, Undercity Entrance to The Cartways Black Market. 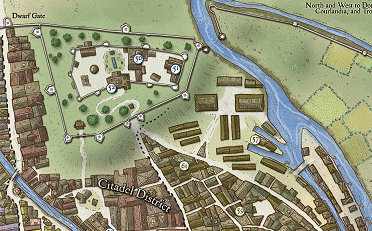 The Citadel, Griffon Riders’ Barracks, Western Barbican, King’s Head Tavern, White Rose Tavern. Further information on council members can be found in the Midgard Worldbook p52-56. Composed of two small courtyards and a dozen two-storey buildings housing masters, apprentices, alchemists and clockwork servants, the Arcane Collegium rarely opens its doors to outsiders. The most common means of entrance are the STEAM GATE that leads into Arcane Square, across from the HEDGEHOG TAVERN, and the WATER GATE leading down a set of slippery stairs to the single pier on the River Argent. The grounds of the college are protected by magic, clockwork traps, gargoyles and even undead under control of the Masters of the Collegium. Some of these masters include Guildmaster Clockwork Mage Orlando (CN male human wizard/expert), Master Necromancer Konrad von Eberfeld (NE male human wizard/expert/eldritch knight), Master Illusionist Ariella Scarpetti (N female human illusionist), Master Diviner Rudwin Whinstone (N male dwarf sorcerer), Master Archiver of Arcana, Tranmus the Tall (NE male human sorcerer) and recently ordained Master of Geomancy Arcael Rennaus (LN male human Imperious Bloodline Sorcerer). Generally speaking the College will usually house about two dozen apprentices and about 40 to 50 retaining staff, although there are often guests and various sages on sabbatical and there are also some secret societies and factions that are linked to the college. One of these is the EXILES OF ALLAIN. Imperious Bloodline Faction of the Arcane Collegium, specialising in the Arcane Arts of the Ancient Caelmaraths that fought to overthrow their Elven Masters in The First Great Revolt about 800 years ago. At this time, dark wizards and tiefling sorcerers called upon the services of Baba Yaga to unbind the powerful elven wards, releasing many demons in the process. Tranmus the Tall is the lead arcanist in this small but powerful faction within the Collegium. He and his scholars study the arcane histories and make annual visits to the Great Library at Bemmea to unearth secrets from the ancient strongholds of Bemmea and Vael Turog. Although some of the work of THE EXILES is specialist and secretive, they are also respected due to their contributions to the college as a whole by the application of the ancient bloodline powers to the current fields of study within the college. This is a small three storey building near to The Wheatsheaf Tavern in Lower Zobeck where Schmidt Happens currently reside. It consists of a common room and kitchen/ablution area on the ground floor, three tiny rooms on each of the first and second floors and an attic above with one small window facing the street that could be used as a store or spare room. All bedrooms have small windows, four facing front and two backward facing. There is a fireplace in the common room and two sturdy doors, one facing the street with a superior lock and one facing the stinking backlane, with two strong bolts on the inside. 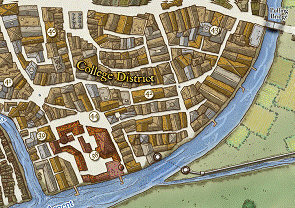 The landlord is Optimus Primeval, a stonemason with reputed links to The Cloven Nine and who has several lodgings throughout the city and himself lives in the Market District of Zobeck. The monthly rent on the apartment is 50 GP, payable to the Landlord of the Wheatsheaf Tavern at the beginning of every month. There are no frills in this modest abode and the general rule abides that “if you break it, you fix it”. This famous garden in the roof of a five-storey building of shops and tenements belongs to Hommnal Agic and is a known meeting place for underworld negotiators needing a neutral ground. 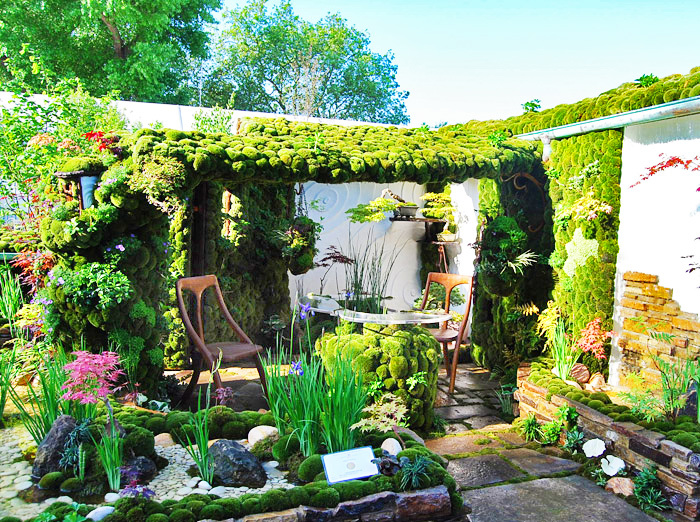 It is also famous for its teas and exotic plants and many brewers, alchemists, chefs and florists can be found mingling with the other customers. The building borders the Market District and Lower Zobeck, near to the water front and is easily recognised by the hanging branches of the great white oak on the rooftop and the purple-leaved vines creeping down the sides of the building. The building has seen better days and its ambitious piping system to provide constant fresh water to the fountains from the river never really worked and is only effective at times of very high water levels after severe storms. However, the place still stands strong and has four blocks of shops on the ground floor and several small tenement flats on the floors between the shops and the garden on the top. The gardens themselves house two fully working greenhouses and several sections dedicated to the growing of lucrative herbs and rare plants, but it is also very decorative, providing a pleasant environment for all visitors and a splendid location for afternoon tea on a warm summer’s day. In deep underground chambers hidden beneath the streets of central Zobeck lies the Cartways Black Market, nefarious bazaar of the dark and sinister, the taboo and the forbidden. Several chandeliers festooned with continual flames give the chamber a glaring, flickering light that the vendors and regular patrons don’t seem to mind. The constant murmur of commerce is occasionally punctuated by arguments as flesh, drugs, stolen goods, and precious information is bought and sold. The threat of violence lingers unspoken with each transaction, and when it does erupt, bystanders observe with a detachment bordering on clinical. A single unspoken rule guides commerce in the market: Keep to your own business, and you’ll live much longer. Split by the Imperial Slave Block, the Market exists in a place of uneasy neutrality. Two long aisles contain most merchants’ excuses for storefronts, business, and entertainments, with the most powerful claiming places along the chamber’s large centre pillars. Any number of strange personalities might appear in the Black Market. It is the proverbial hive of scum and villainy that attracts all types and demeanours, including Dobricar the Slaver Captain, Vukas the Market “Mayor”,Ticker Nicktailson, Gearworker Journeyman and lifetime member of The Redcloaks, and of course, the gorgeous ghoul, Radu Underhill. Lying at the very heart of the city just south of Crown Square, this revered establishment once the epitome of the extravagance of the ruling nobility is now a shared social space dedicated to the triumph of the public revolt. It has two floors, one at ground level with a balcony overlooking the main pool which is in the larger section below ground, with the main pool being open to the sun. Inside the building are various attendant rooms, including the grand lounge, several plunge pools, a chilled pool, saunas, massage parlour and gymnasium. The warm, azure tiled main pool is served by a channel from an underground spring pool and open to the sky with the covered portico of the terrace surrounding it. No weapons are permitted into the building, apart from those of the armed guards. Clothing and weapons must be left in the change rooms near the entrance and only towels are permitted by the patrons who pay a pricely sum of 2 silver pieces to enjoy the luxury that was once the sole preserve of the aristocracy. Even so, the human manager of the city run establishment, Zsolt, would like to see prices increased to be more restrictive and elitist of its clientele. There are many well-to-do socialites who frequent the pool for business and pleasure, including Svetlana, a local courtesan, Radu Underhill, an important CARTWAYS trader, and indeed even some of the Consuls themselves at times. The Massage Parlour is run by an elfmarked opportunist of well-groomed appearance named Mikhail. He is in love with Svetlana and makes friends with all stripes, supposedly gathering blackmail on the rich who purchase his services and occasionally even co-ordinating robberies of his clients after visits. This is an area of LOWER ZOBECK, near and around The Red Queen Gambling Hall and not too far from 10 Wheatsheaf Lane. It is commonly known to be a rusting corner of decaying industrial sites haunted by the corroded ghosts of machinery. Locals talk in whispers of Night-Things although not many people seem to know what they are – just that they should be avoided. While outwardly similar to any other part of the city, the signs of rusting industry litter THE TARNISH; chimneys rise from the side of buildings, waterwheels rust in crumbling pits, and gears clutter street sides. This once opulent building in LOWER ZOBECK is a Temple to Sarastra, Goddess of Night and Magic, and patron to the Shadow Fey. In the days of Stross Family Rule, it was very popular since the evil family not only took part in Devil Worship but also payed homage to the Shadow Fey. Support, and therefore funds, for the Temple have dipped in recent times but it still remains open, holding most of its ceremonies at night when supporters, predominantly Tiefling Arcanists, some humans and even those with Shadow Fey persuasions, are more able to sneak into the area without being noticed. Tranmus the Tall, of the Exiles of Allain at the Arcane Collegium is one of the frequent visitors here and is on good terms with the Head Priestess, Mistress Alice Cooper of the Dark Night, who runs the place with several acolytes, including Acotytes Rihanna and Kesha. Not much activity takes place during the day but the office is sometimes open, where an acolyte will be on duty to meet with members of the public. Current residence of Arcael and The Oooze. This is a small three storey building just a couple of blocks away from The Wheatsheaf Tavern in Lower Zobeck where the player characters currently reside. It consists of a common room and kitchen/ablution area on the ground floor, three tiny rooms on each of the first and second floors and an attic above with one small window facing the street that could be used as a store or spare room. All bedrooms have small windows, four facing front and two backward facing. There is a fireplace in the common room and two sturdy doors, one facing the street with a superior lock and one facing the stinking backlane, with two strong bolts on the inside. 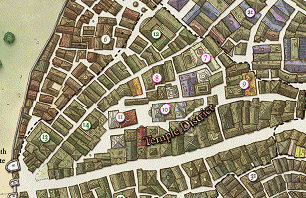 The landlord is Alladin Sane, a notable gear merchant with reputed links to the Dwarven underworld and who has several lodgings throughout the city but lives himself in the Market District of Zobeck. The monthly rent on the apartment is 50 GP, payable to the Landlord of the Wheatsheaf Tavern at the beginning of every month. The rent on this property is paid by sponsor Alexei Splitleaf of Allain. In the time that the party have been in Siwal, Truman Click has returned from the Dwarven Canton wars and has invested money in the place to have an extra floor extended onto the property to add two new rooms to the place, thus accommodating Xavier and Saabu Theet. The nominal rent is still paid to Alladin Sane by Alexei. Modelled after the great Blue Water Inn in Siwal, Xavier has spent his first three years in Zobeck, planning, arranging and building a new Blue Water Inn in Zobeck. Much like his old establishment in the dry heat of Nuria Natal, he has poured his money, his dedication and his energy into the place, and with the help of his new business associate, ex consul of Zobeck, Lord Volstaff Graymark has been able to open the establishment with full planning permission and a full liquor license to an eagerly awaiting clientelle, hungry for something with a difference. Detailed description to be found here. 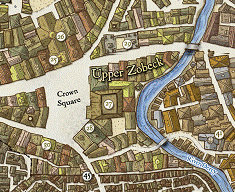 The Spyglass Guild is Zobeck’s “secret police”, a quasi-legal organization answering ultimately to the Lord Mayor and the Council of Praetors. Mistress of the guild is Ersebet Cemilla but she answers to Lady Marack, Praetor of the Blue House. The Cloven Nine is an infernal group of gangsters. 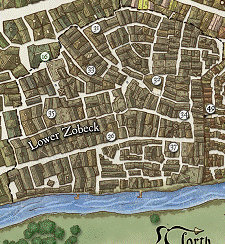 A favourite haunt and secretive meeting place is The Wheatsheaf Tavern in Lower Zobeck but an even more notorious venue is The Silk Scabbard on the meeting point of Upper and Lower Zobeck with the Koblold Ghetto. 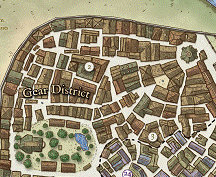 Owned by Tyron, but supposedly backed by Lord Greymark himself, it houses gaming, gambling and prostitution, all engaging members of the Cloven Nine, a collection of rogues, sharpers, cultists, assassins, fences and cold-eyed hard cases that is ever-changing but always dangerous, alert, and looking for an opening. The party know the tiefling, Andros, to be a lieutenant of this gang. According to the Spyglass Guild and the City Watch, this gang of kobolds is controlled from the inner depths of the Kobold Ghetto, working primarily at night and with nefarious links to the Greymark warehouse and The Wheatsheaf Tavern. The Cloven Nine have links with some of its members and sometimes meet in The Wheatsheaf, using Jhoram the Moneychanger (LE Male Tiefling Wizard) as liaison. They know that the gang is not just a chaotic collection of Kobolds and actually believe the gang to be controlled by a Councellor of Zobeck with considerable influence and leanings towards Devil worship. it is known by both Goran and Karn Gudin that Toothy Grimm is a member of this gang. This is a non-aligned messenger service that works throughout the city. Most inns, hotels and public houses will have contacts within the service and are able to employ their services relatively quickly. Based in the GEAR DISTRICT, they work closely with the STEAMWORKERS’ GUILD and are responsible for the building of all GEARFORGED in Zobeck (and most other machinery). They are run by a TRIUMVIRATE consisting of a human (Tinker Watson), a dwarf (Vorgen Clocktapper) and a GEARDRAKE (Grundig McGregor). They have a large and busy workforce facilitated by several managers and a multitude of UNDERMANAGERS, one of whom, Angus Short, is a friend of Truman Click. The popular meeting place for workers is The Grey Friar Tavern. The River Argent is Zobeck’s most important trading route and the Bargemen’s Fellowship know most of what comes in and out of the docks from as far afield as Runkelstad, Orkasa and even Cronepsisht. Celia Black is said to have good contacts with this organisation, which is run by the self-titled “Barge King”, Sundran Karesh.